Sling Scripting Thymeleaf is the scripting engine for Thymeleaf (3.0) templates. By default Sling Scripting Thymeleaf's ScriptEngineFactory is configured for templates with extension html and mime type text/html and uses all of Thymeleaf's standard extensions either also or exclusively. The Sling Resource TemplateResolver is configured to resolve templates with use decoupled logic enabled. The Pattern TemplateModeProvider is configured to match template paths against default extensions for providing template modes (of course except no-op mode RAW). The ResourceBundle MessageResolver is configured to use the message's key as absent message representation. Sling Scripting Thymeleaf comes with its own dialect using the sling prefix/namespace currently supporting the include feature known from Sling Scripting JSP Taglib. 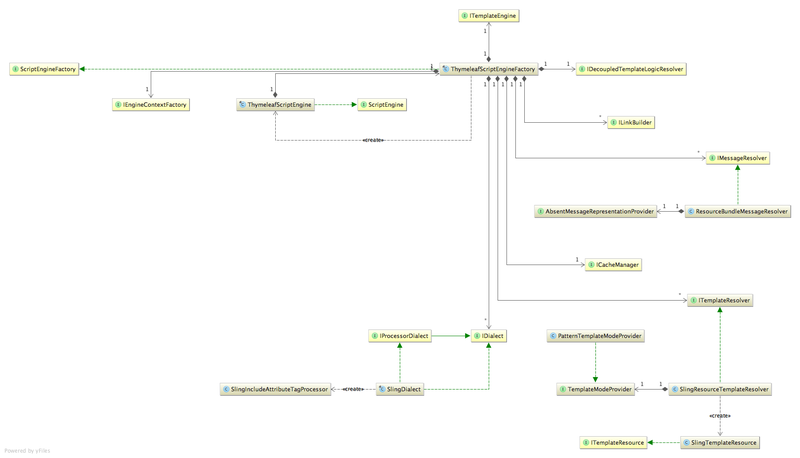 include - The resource object (Resource) or the path (String) of the resource object to include in the current request processing. If this path is relative it is appended to the path of the current resource whose script is including the given resource. addSelectors (String) *: When dispatching, add the value provided by this option to the selectors. replaceSelectors (String) *: When dispatching, replace selectors by the value provided by this option. replaceSuffix (String) *: When dispatching, replace the suffix by the value provided by this option. resourceType (String) *: The resource type of a resource to include. If the resource to be included is specified with the path attribute, which cannot be resolved to a resource, the tag may create a synthetic resource object out of the path and this resource type. If the resource type is set the path must be the exact path to a resource object. 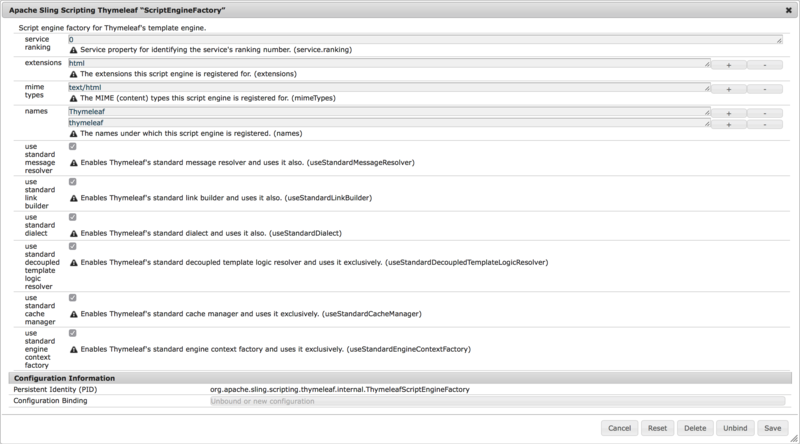 That is, adding parameters, selectors and extensions to the path is not supported if the resource type is set. 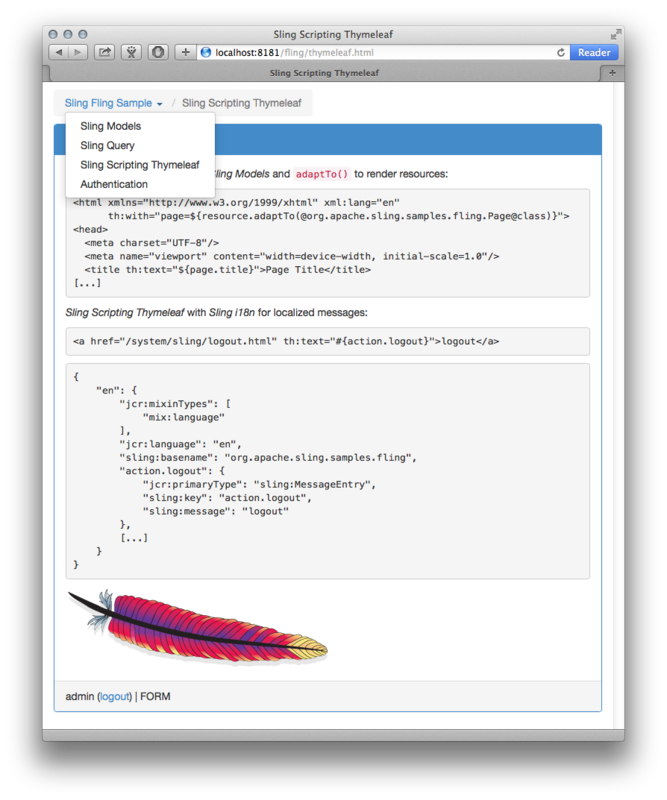 The Sling Fling Sample is a sample using Sling Scripting Thymeleaf with Sling Models and Sling Query.